Marine Gems: Fishsteria Waterside is the casual, laid-back second branch of the Fishsteria concept, which puts sustainably-sourced seafood at the front and center. Look & Feel: Sprawled along the waterfront of Kennedy Town, Fishsteria Waterside features a view of the water that’s shown off all the more by its floor-to-ceiling windows. Bespoke light fittings made from fixtures from a classic Italian row boat add to the nautical feel. On the Menu: Expect Fishteria’s signature unpretentious Western fare prepared with top-tier ingredients. The menu is mostly soups, pastas, salads and sandwiches as well as caviar, oysters and seafood platters, which are perfect for sharing. 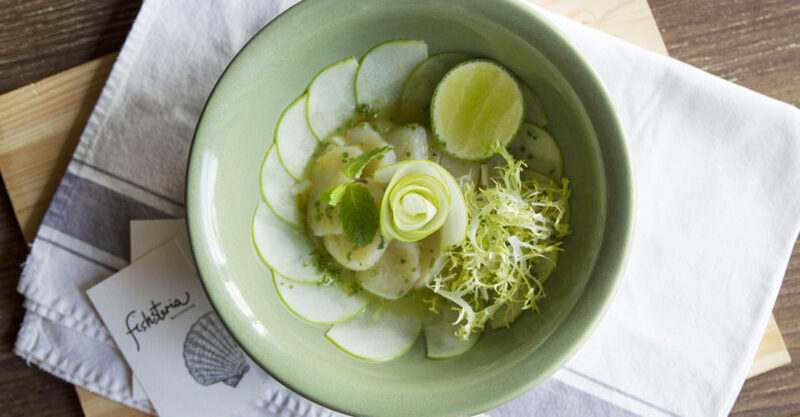 Go for a tried-and-true favorite (the lobster roll, $168) or a new addition (scallops and apple ceviche with lime, pictured, $198). The food menu is complemented by wine and craft beer. Meet the Chef: Chef and owner Gianni Caprioli kicked off his career at a local seafood restaurant in his native Rimini, an Italian seaside city off the Adriatic coast. His love of seafood persisted throughout his career in Japan, the USA, France — and now, Hong Kong. Great For: Hanging out with the family or with friends who have kids; lazy, lingering brunches along the water. FYI: The restaurant has a foosball table!